Geoarchaeology interweaves geologic techniques, GIS, remote sensing, and geophysical techniques into Archaeology research. Quaternary studies branch out to investigate landscape evolution, climate change, paleoecology, and active tectonics over the last two million years. Research activities include field, laboratory, geographic information analysis, and modeling studies that focus on the timing, causes, and mechanisms of natural and anthropogenically forced climate change, and on the effects of past climate changes on the physical, biological, chemical, social, and economic conditions of the earth. 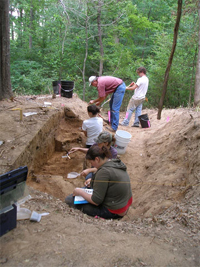 University of Memphis Archaeology programs outside of Earth Sciences can be accessed through the Archaeology website.